Indoor barbecue smokers tend to be small enough to fit on a counter (which limits capacity) and I’m leery of anything that makes smoke in an enclosed space. Having said that, the Kalorik Multi-Purpose Indoor Electric Pressure Smoker is the third indoor smoker I’ve come across and I’d be more than happy to give it a review if Kalorik sends me one. 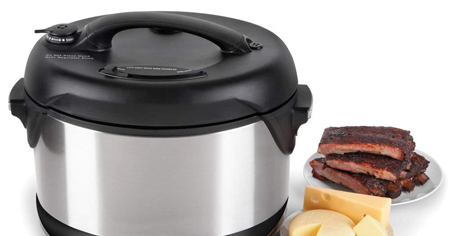 The company says the 6.5qt unit can be used as a pressure cooker, smoker, slow cooker, or steamer, unlike the two other specialty cookers I’ve come across. 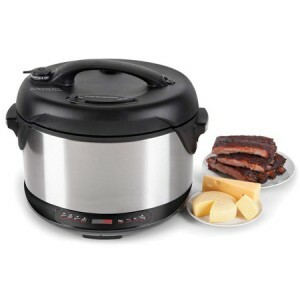 You can infuse meats, cheeses, vegetables, and other ingredients with smoky flavor using hot or cold smoking methods inside the unit’s non-stick aluminum pot. That’s good to know if you’re doing cheeses or another small project and don’t want to bust out your full-size smoker in the yard. The unit also includes a charring cup with lid, a 2-level smoking/steaming rack, a measuring cup, a spoon, and a variety of recipes. As to how well the Kalorik works, the only problems I’ve heard of so far with it are its limited capacity (it measures 16.5×13.8×12.2 inches) and the location for the wood chip cup, which makes refilling it on a longer smoke problematic in that you need to open the thing up to do so.